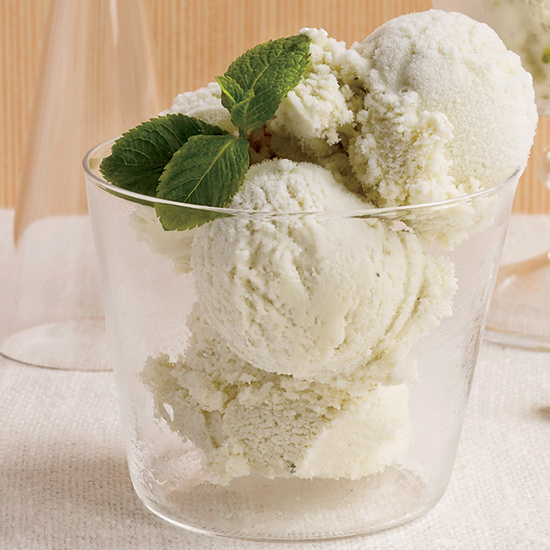 For a cool, refreshing wake up, look to this tasty mint ice cream from Jeni Britton Bauer of Jeni's Splendid Ice Creams. This exceptionally creamy ice cream relies on two unexpected ingredients: corn starch (to help thicken it) and cream cheese (to make it scoopable). Note: cream cheese is also a breakfast ingredient. Mint taking over your garden? We're here to help. We’ve rounded up the best and most fragrant recipes to up that incredible, fast-growing herb. Aguas frescas are traditional Mexican drinks made with ice water, sugar and fruit. Pastry pro Sherry Yard takes some liberties with her particularly refreshing version, adding fresh mint and ginger along with some lemon juice and honey. It's also terrific with a shot of rum or vodka. This supremely simple fruit salad is the ultimate refresher on a hot day. For a grown-up version, add a splash of rum. Padma Lakshmi calls this sauce "liquid heaven." She purees sticky dates with fresh mint, lemon juice and chile, creating a sweet, bright-flavored and slightly spicy sauce. It's a stellar accompaniment to the kathi rolls, but Padma also uses it as a sandwich spread or whisks it into salad dressing. A mix of brine- and oil-cured olives makes for a more complex pesto. This exceptionally creamy ice cream relies on two unexpected ingredients: corn starch (to help thicken it) and cream cheese (to make it scoopable). Here, mint plays the star role in a refreshing summer salad.